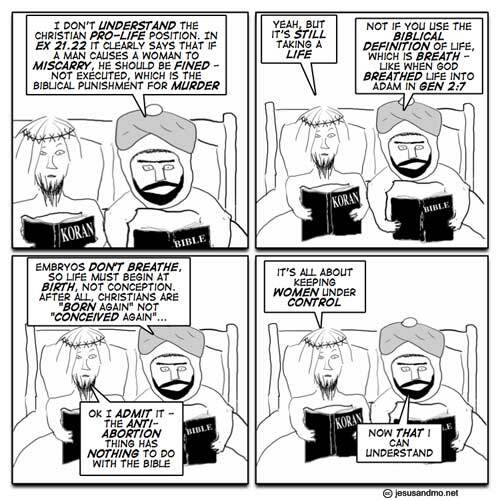 From Jesus and Mo (Hat tip to Grrl Scientist). Conservatives just cannot resist rewriting American history to support their beliefs. The most common manifestation of this is conservative revisionist history which denies the role of separation of church and state in the establishment of our government. Mike Huckabee practiced some revisionist history of his own as he claimed that most of the signers of the Declaration of Independence were clergy men. PolitiFact reports that Huckabee is way off in his count. During the Republican debate, Mike Huckabee said he believes one of the defining issues facing the country is the sanctity of human life. Arguing that the issue is of historical importance, he invoked the Declaration of Independence’s rights of life, liberty and the pursuit of happiness and said that most of the signers of the declaration were clergymen. A few more of the signers were former clergymen, though it’s a little unclear just how many. The conservative Heritage Foundation said two other signers were former clergymen. The religion web site Adherents.com said four signers of the declaration were current or former full-time preachers. But everyone agrees only Witherspoon was an active minister when he signed the Declaration of Independence. One issue that may contribute to the confusion about which signers had a history in the clergy is that during the time the Declaration was written, people who studied at universities often received doctorates of divinity, a common degree designation, even if they were not working clergy, said Mary Jenkins of the Independence National Historical Park. As for religious affiliations, all of the signers were Protestant Christians with one exception, Charles Carroll of Maryland, who was Roman Catholic. Not only is Huckabee wrong in his history, but this claim does not necessarily support his arguments against abortion rights as not all members of the clergy necessarily would oppose this right. Many of the founding fathers were Deists who rejected orthodox Christian beliefs. The founding fathers were also heavily influenced by the principle of separation of church and state and would not necessarily have supported legal restrictions on abortion regardless of their personal beliefs. As this was not an issue at the time Huckabee cannot simply assume that the founding fathers would have supported his view on abortion, and it is clear they differed with him with regards to the role of religion in government.